In our MS SQL environment we use dedicated swap drive wich almost is full becouse of we set it up Custom size. Despite of it is a normal behavior, vROps generate “Guest file system space usage” Alert. In this article I would like to show you how to manage this situation in vRealize Operation Manager and avoid unnecessary alerts. We want to keep alert to C: and H: drive, but we don’t get alert from S: (swap) drive, unless it is full. First of all we can create new symptoms to this VMs. You can see the table below. Create Warning (85%) , Immediate (90%) and Critical (95%) symptom to C: and H: drive too. As you can see in table. For S: drive enough Info level and condition will be “is greather than or equal to” with value 100 (precent). So the swap drive is full, vROps will create an Alert. 100% is just an advice, you can change the value as you wish, customize your environment. We can use “Guest File System stats / Guest File System Usage (%)” metric under effected drive. As you can see, in this list we don’t see S:\ drive. In the interest of we see our VM’s S:\ drive click the little grey icon next to Metrics select list form. In the new window you can find a list of all VMs, select that VM wich want to configure, and click OK, than you can see the all drive under Guest File System stats. Choose drive eg. C:\ and under the drive letter you will find the “Guest File System Usage (%)” metric. Drag and drop to right side of window. 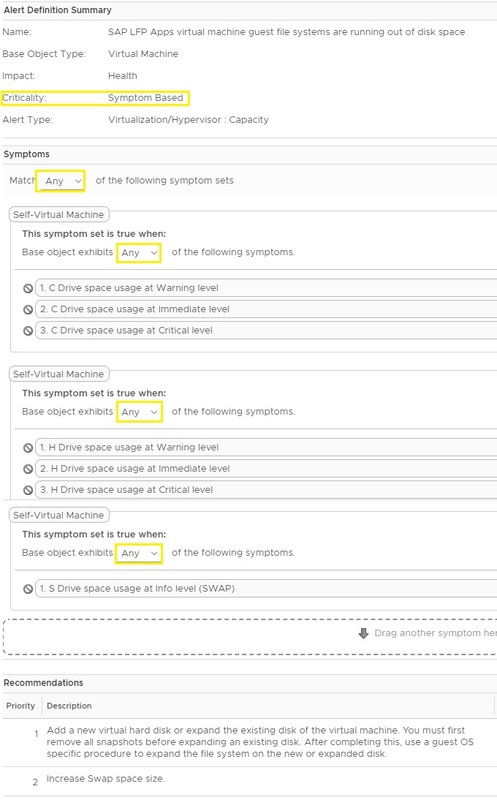 Create all symptoms from list of below. From this symptoms we can create new Alert. If you did everything right, you will see similar things as picture below. In “8. Apply Policy to Groups” part select the custom group wich was created before, and click OK. If you have any question pls. leave comment. This entry was posted in VMware and tagged VMware, VMware vRealize, vRealize Operation Manager. Bookmark the permalink.